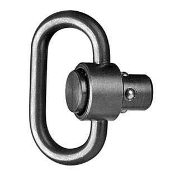 The FAB Defense QD Sling Swivel mounts to any quick release socket. An essential component for any QD sling setup. Mounts to any GLR16 or GL-Shock buttstock or to any quick release socket.